I've written a lot about sensory bins, but I've never done a post about how we store our supplies. We use a lot of Safari toobs as our themes. 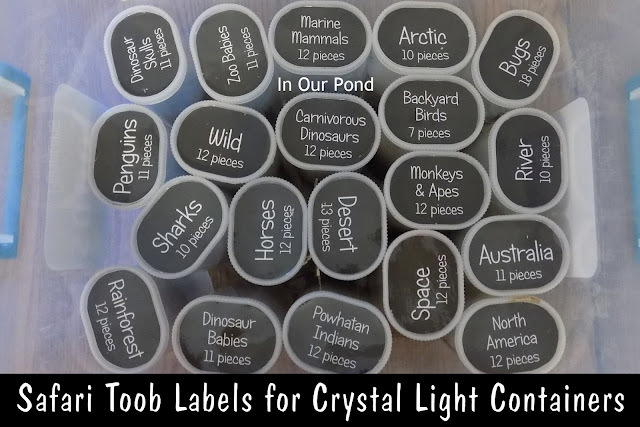 I put our figurines in crystal light containers (we don't even drink the powder- I just love the containers), which are a uniform size, easy to buy, and easy to open and close. 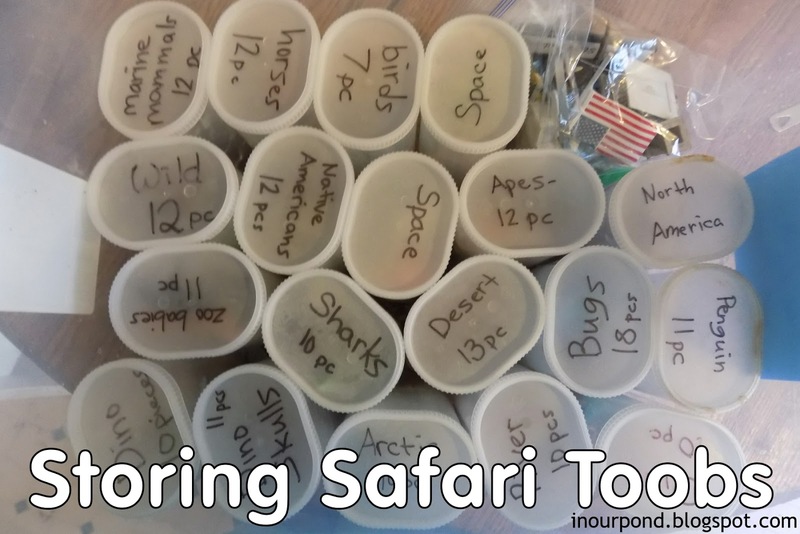 I write on each container the toob it holds and how many pieces are in each set. Having a total number of pieces helps us make sure that all the pieces end up back in the container, especially on a day when I have more than one kid sharing a toob or if we have more then one toob out at a time. As you can see, we have quite a collection- and I still have more on my list. As readers of my blog have probably figured out by now, we use little containers for sensory bins. This Sterilite bin is about 13x7 inches and only 2-3 inches deep. 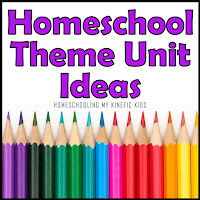 One child uses the bin at a time, because the activity is part of our homeschooling rotation. 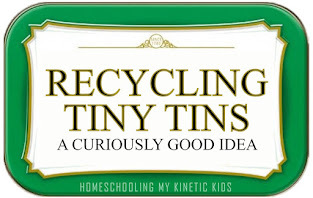 I have 3 bins, though, for times when they each need their own. 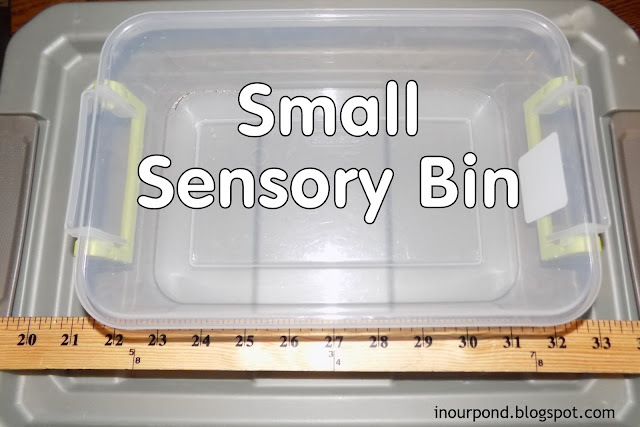 Because we use a small container, we don't need very much substrate for each bin. 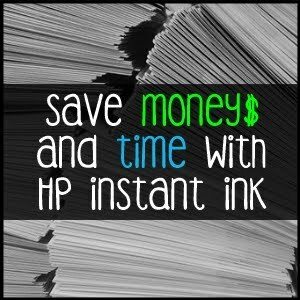 I usually put 1/2 to one cup of materials, which are stored in ziplock bags when not in use. As you can see, I've collected a variety of different materials over the years: small cups for pouring and scooping, foam apples, mixed beans, colored sand, rocks, shells, colored rice, pompoms, flower pedals, pumpkin seeds, acrylic jewels, glass stones, and more. It's easy to add different types of materials depending on what you have in the house or the season. We also like to use mud, water, snow, jello, and other one-time-use substrates. Oh, and we only use biodegradable water beads outside, because they bounce. You're only limited by your imagination! We also like to keep a pile of extras around for the sensory bin: scoops, construction trucks, nests, paintbrushes, and miniature garden tools. 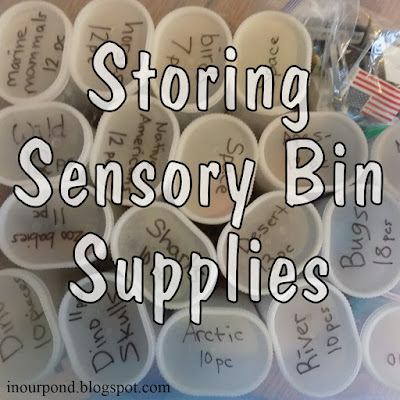 Both bins fit on one shelf in my cupboard, always ready for sensory fun! 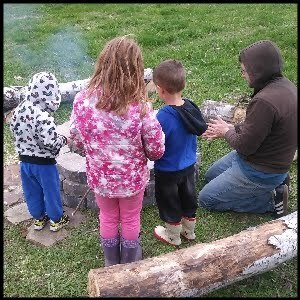 Please consider helping to support my blog by shopping through the Amazon links below. Thank You! I had to perform an intervention on myself because I was so obsessed with those Crystal Light containers, and the off brand ones also, which are not clear. I still hoard them, but I forced myself to get rid of a few bags of them. 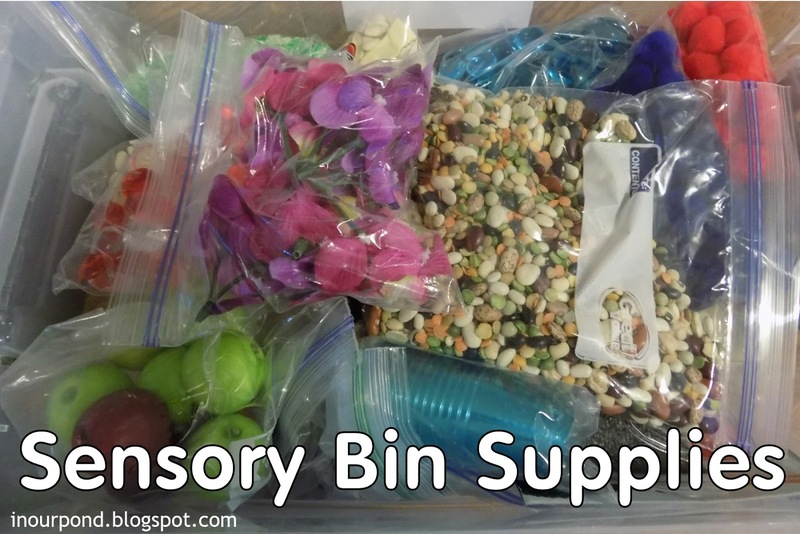 And I love looking at all of your sensory bin ideas for the different themes!